Another two more truckloads of the finest nursery stock has arrived at Greenscape Gardens. 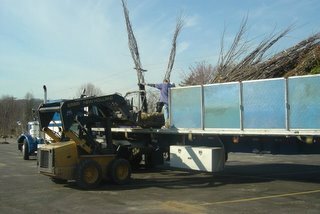 A truckload of decidious trees including 4 different varieties of maples, 2 varieties of ash, magnolias, river birches and some of the nicest dogwoods you've ever seen were unloaded today. At the end of the day, a truck arrived with some unusual plants from Oregon. We still have three full tractor trailer loads of nursery stock from Oregon slated for the next couple of weeks. The plants are really rolling in now. Let's just hope that "Mother Nature" cooperates.